Watch full Ginga Eiyuu Densetsu Season 2 Episode 8 English Subbed full HD online. Ginga Eiyuu Densetsu Episode 34 English Subbed online for free in HD. Return. Reinhard is displeased by Kempf’s report and decides to dispatch Mittermeyer and Reuenthal Fleet; he thinks the best tactics was to smash Geiesburg against Iserlohn and destroy both fortresses (Yang has the same idea). Imperial scout ships detect Yang’s reinforcement fleet. 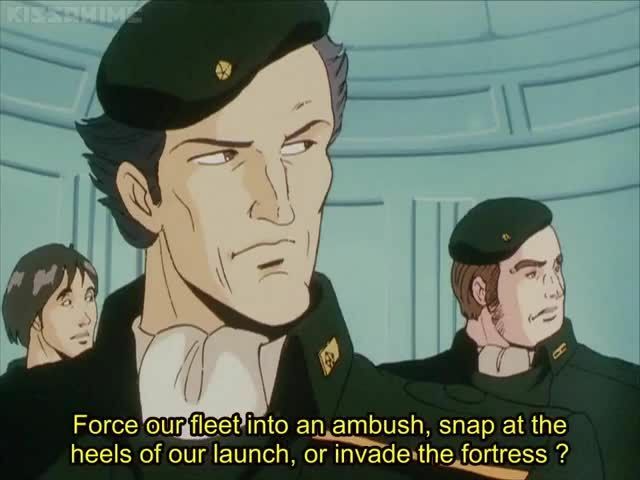 Kempf plans to lure the Iserlohn Fleet out of the fortress by pretending to retreat, then strike and seal it in the fortress, which will allow him to attack the reinforcements. Julian Minci sees through his plan. Merkatz, leading the Iserlohn fleet, pretends to fall into the trap, thus the Imperial Fleet is attacked from behind when it engages Yang’s fleet. Kempf finally decides to smash Geiesburg into Iserlohn, but the Alliance’s fleet destroys the engines, and the damaged the fortress moves randomly, destroying many imperial ships, before blowing up. The Imperial Fleet falls back but, against Yang’s order, some commanders decide to pursue the Imperial Fleet.